Description Perform a forward or reverse linear, parabolic or hyperbolic radon transform on gathers (or perform radon demultiple). The Frequency Domain Radon process models seismic data using linear, parabolic, or hyperbolic curves. In combination with other processes, it can be used to remove coherent noise from gathers, e.g. linear noise and multiple reflections. The process operates in three modes: forward, reverse and demultiple. In Demultiple mode, the forward transform, a mute and the reverse transform are applied. Specify (TWT, Moveout) pairs to define the mute behaviour. When using forward and reverse modes, apply a Polygon Mute process to the forward transform result using a polygon picked on the P domain gathers. Direction — The mode of operation. Demultiple: forward transform, apply mute, reverse transform. Volume — The data to transform. Records use the sort order of the input data (i.e. input data organised into CMPs will be processed as CMP records). Offset — Where to get values for trace location within the record. Calculate offset from the SX, SY, GX, GY headers (scalling/SCALCO is applied). Type — The basis function to use in the transform. Hyperbolic curve reference depth: This is the reference depth for time invariant hyperbolic curves. Used only with Hyperbolic basis functions. Input Data Mute — A mute to apply to data prior to transformation (see Angle Mute and Mute Picking). The mute is treated as an outer mute. In demultiple mode, the original input data is restored in the muted area after the reverse transform. Min/Max Velocity — The smallest and largest values to model with the basis function. Parabolic or hyperbolic function: units are in ms of moveout at the reference set (default 5,000m). Linear function: units are m/s. Start Time — Start modelling at this TWT. If blank, modelling will start at the beginning of the trace. Start Ramp — Apply a ramp when blending the processed and unprocessed data at the end of the operation (if a start time is set). The ramp is centred on the start time. End Time (ms) — End modelling at this TWT. If blank, the modelling will end at the bottom of the trace. End Ramp (ms) — Apply a ramp when blending the processed and unprocessed data at the end of the operation (if an end time is set). The ramp is centred on the end time. Top Pad — Apply padding to the top of the record to improve modelling of events that start above the record. # P Traces — The number of basis functions to be used in the transform. If specified, a band pass filter is applied to the input data prior to performing the radon transform. See the Bandpass Filter process for more information on parameters and how they affect the filter shape. f1 — Low Stop (Hz). 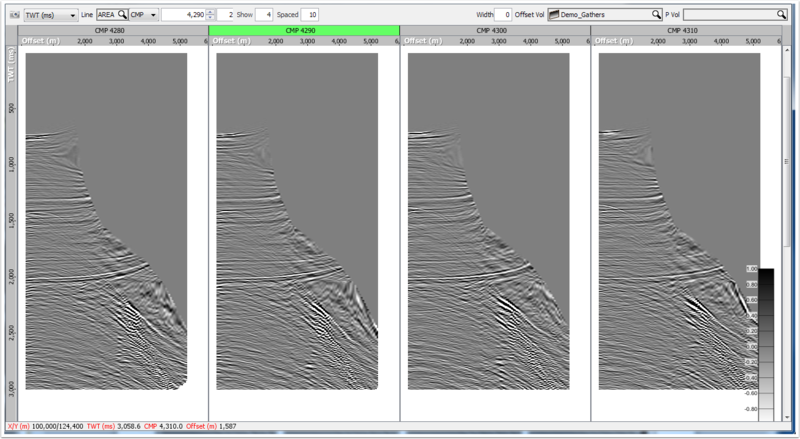 The beginning roll in frequency of the filter. f2 — Low Pass (Hz). The ending roll in frequency of the filter. f4 — High Stop (Hz). 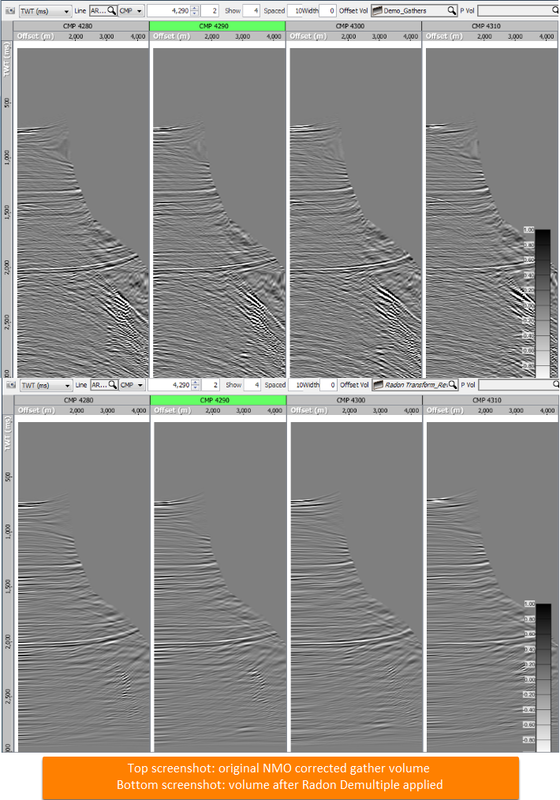 The ending roll out frequency of the filter (defaults to Nyquist frequency if blank). Time taper length (ms) — Apply a taper to the start and end of the analysis window. Spatial taper length (traces) — Apply a taper to the start and end traces in the record. P domain taper length (traces) — Apply a taper to the start and end traces in the P domain. 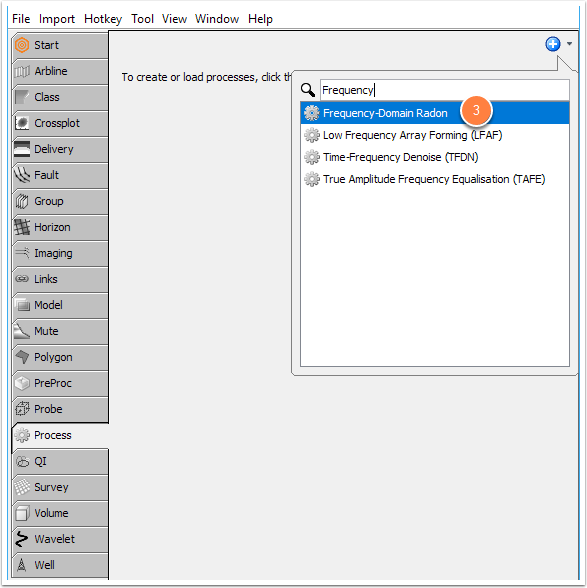 Output noise model instead of filtered traces — If enabled, the output volume contains the data that would be removed during the demultiple/mute operation. For QC, enable this option to easily identify whether primary is affected. Minimum number of traces — Do not apply demultiple if the record contains fewer than this number of traces. 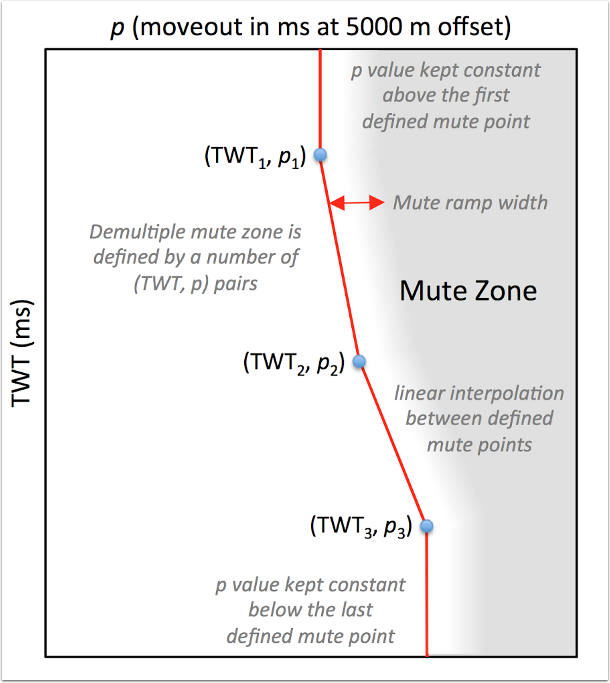 Interpolation Header (Demultiple) — Determine the mute value by interpolation based on the trace header selected here. Leave blank to use a single mute function for all gathers, specified by (TWT, move-out) pairs. 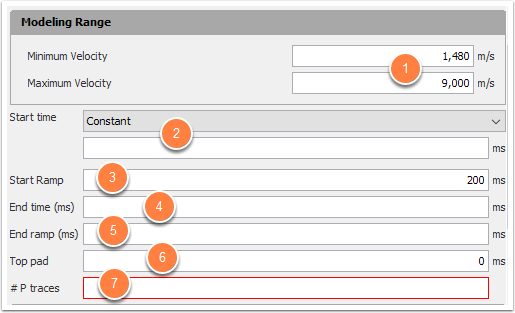 If a header is selected, mutes are specified by (<<selected header>>, TWT, move-out) pairs. The move-out to use is determined by interpolating the mute functions according to the trace header value for each gather. The table of values specifying the mute as a function of time. (<<selected header>>, TWT, move-out) triplets if an Interpolation Header is specified. The move-out values at the smallest and largest TWT values are projected up and down. Use the forward/reverse transform and the polymute process for more complicated mutes. Only "P domain" gathers, transformed via forward radon, can be selected. In this example, Insight converts the original NMO corrected gathers into the Tau-P domain. A polygon mute is drawn and applied via the Polygon Mute process. 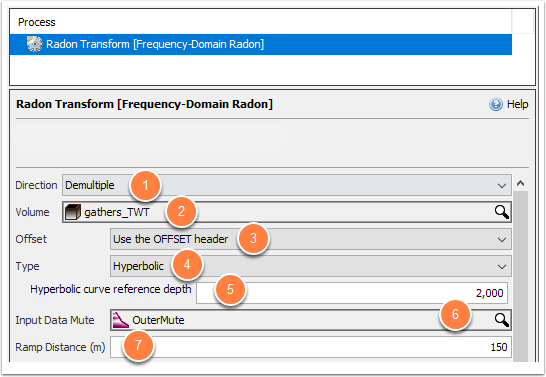 Radon Transform reverse is used to convert the data back to offset domain. Create Frequency-Domain Radon process - direction forward. Set parameters and display resultant volume in Gather View. 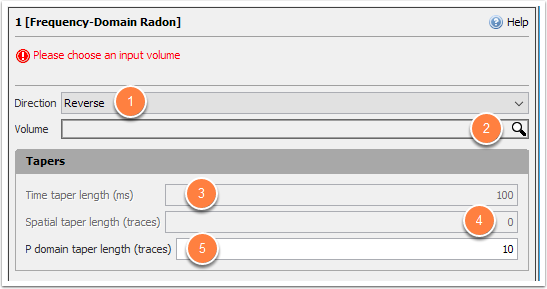 Tip: QC volumes by turning off all volumes and selecting only original NMO corrected gathers and final Radon demultiple reversed volume in the Volume tab. Use the middle mouse button to flick between the two volumes, or use the PageUp/PageDown Hotkeys.